At first I didn’t want to go see Chicken Boy, I had been in the LA area on business for a few days and checked out the other M Men in the area but kept putting this one off. I think I was still trying to make up my mind if he even qualified as a muffler men with his big chicken head. Things have changed a bit nowadays and if I even here that someone has a thumb of a muffler man I’ll drive out of my way to go see it. 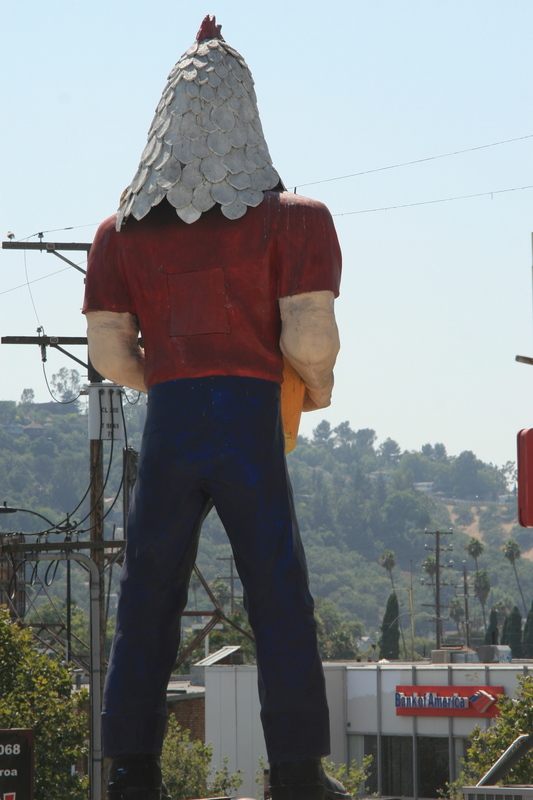 However there was no denying from the pictures that Chicken Boy was a muffler man and a trip to get some auto parts took me and my coworker within a mile of his location in Highland Park. I write from time to time about the famous muffler men or the better known one’s and Chicken Boy certanly makes the list. 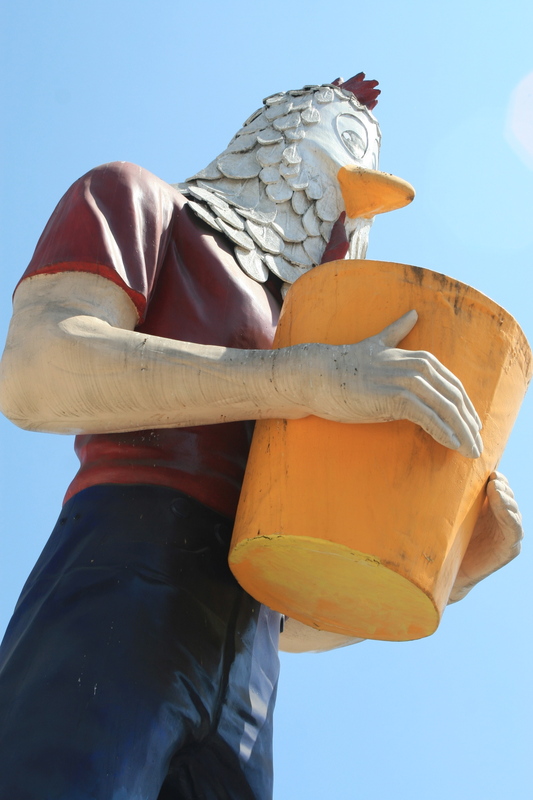 He has been around LA since the late 60’s and was purchased from International Fiberglass for the Chicken Boy Fried Chicken Restaurant in downtown LA on Broadway. There’s still a few unknown facts like did he come with a normal bunyan head and was it cut off? The hands look IF to me and it looks like the fiberglass company used two modified right arms and turned them in a bit to hold the big bucket of chicken. I’m not sure if the bucket came with the M Man but the chicken head was made by an artist from Palm Springs. Chicken Boy stood on the roof of the 3 story building for about 16 years with his big bucket of chicken until the owner passed away and the family had no interest in keep the business running. Thats when Amy Inouye came into the picture. Realizing that this downtown LA icon was about to bite the dust she started calling the realty companies asking them what they were going to do with the giant. After a few calls the realty companies started calling her asking if she could take him! So on a dark night in May of 1984 around 4am, some guys Amy hired from a sign company pulled up with a semi truck, flat bed trailer and a cherry picker and picked the M Man right off the roof by his eye bolts and that was the close of his chapter on Broadway. An interesting side note here is that all M Men were shipped with eye blots one on each side of their shoulders. Many of the M Men standing today still have them. For years he laid on his back at a friends house and only once between 1984 and 2007 was he ever set back up. It was a brief 6 week stint at a downtown mall in LA and typical to muffler man style he attracted allot of attention. Finally in October of 2007 he was set back up and once again can be enjoyed by the public and the occasional long distance trekker like myself. It was hot the day we stopped in to see him and from the north he was almost completely blocked by a huge Sierra Mist billboard in Spanish. I noticed the hands and how they were unique for a muffler man and also that he had bunyan suspender buttons on his pants but interestingly his plant legs fell all the way to his shoes. I have always enjoyed muffler men standing on buildings or tall poles a bit less because it’s harder to notice the details. After taking a few pictures I walked into a buisness next door and asked the owner if I could climb up on his roof to see the Chicken Boy. He kind of looked at me strange probably wondering how I could have missed him while standing in the street but surprisingly he nodded his head and said “go for it” There was no easy way to get on the roof but after some creative planning I was up and able to get a much better look at his feet. Like many other M Men he’s got those cut marks just below the knee but in addition to that he has been modified with fake pant legs that extend down to his shoes. I also noticed the square hole in his back covered by a panel and that is also something I am starting to see more and more of. Often the owners of muffler men would install a speaker of some kind in their giants so they could “talk” to kids and visitors that stopped by. These holes are often whats left of the access hatch to maintain, repair and install that equipment. 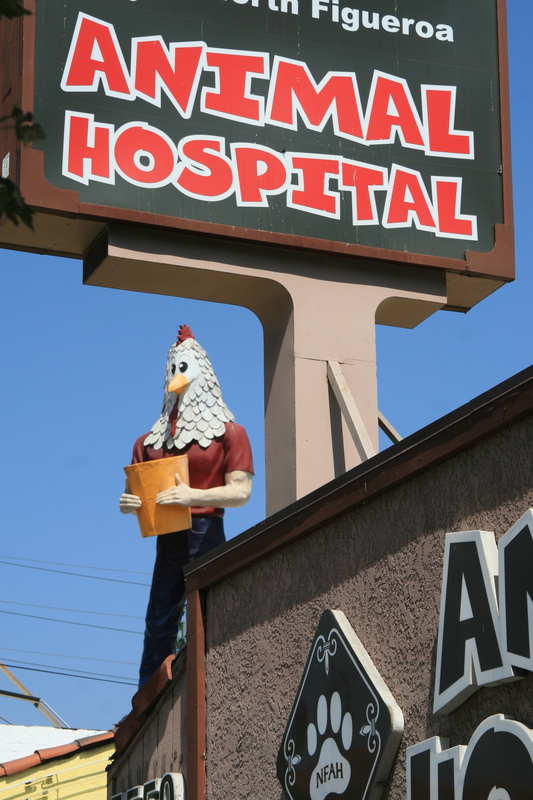 Today Chicken Boy can still be found on the roof next to the animal hospital while a certain artist in Palm Springs, CA would rather be remembered for his water colors then the 8ft chicken head he made for a muffler man in 1968. Enjoy our episodes? Click to help fund Episode 12! Interested in weekly Muffler Men updates? Follow us! All the photos at this blog are copyrighted by usagiants.com and may not be used for ANY purpose (blogs, websites, Facebook, Pinterest, etc.) with written permission from me. If you want to share a photo, you are welcome to include a link to my blog post where the photo appeared. However, do not download and upload ANY photos without my consent. In some cases, I have used photos in my posts from other people. If you want to use those photos for any purpose, you need to contact the photographer directly before doing so. Thanks!